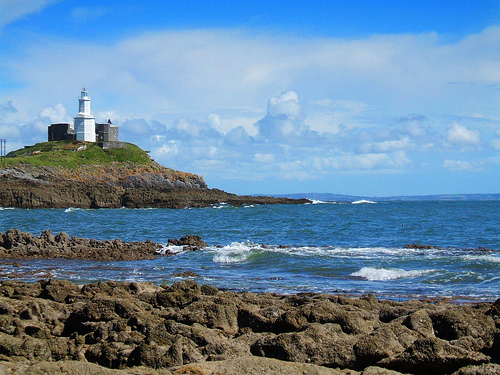 Though it may well sound like a sleepy little backwater with a name like Mumbles, it is in fact a bright little village set beside the sea with plenty of things off offer its visitors. Just to confuse things Mumbles also goes by another name, that of Oystermouth, and is located right on the southernmost point of Swansea Bay, only a mere five miles or so from the centre of Swansea. As if two names weren’t enough the area is also widely regarded as the ‘Gateway to the Gower Peninsula’, with so many names you would expect something special from the place, which of course it delivers. This is a part of Wales that has a deep and rich heritage, and is a great place to find some fabulous independent shops and unique boutiques, as well as cosy village cafes some incredible restaurants and plenty of galleries which are filled to bursting with local artworks and craft offerings. One of the things that Mumbles is best known for is the amount of independent traders that have their stores here. Enjoy a spot of retail therapy here and you could well find everything you need from designer fashion to free and easy surf wear, not forgetting some incredible handmade confectionary, continental meats and of course, traditional hand carved wooden love spoons. Mumbles is a very original, very eclectic and very unique little seaside village. It is not all about the retail therapy though as there are also salons and spas where you can indulge in some well deserved relaxation and massage therapy too. Food tops the list when it comes to things to do as there are so many great restaurants that you are spoiled for choice when it comes to dining opportunities, especially with a fresh supply of incredible seafood being landed daily just metres away from the restaurants. Not only is seafood popular here there is also a passion for ice cream, with some of the most well known ice cream parlours anywhere, being located here. The beaches of Limeslade Bay and Bracelet Bay are both only a few minutes away from the heart of the village and offer beautiful, clean beaches with opportunities for sailing and a host of other water based sports. There has been a settlement on this part of the Welsh coastline for centuries, and much of the history of the region along with artefacts that have been discovered here are on display in the village. The lighthouse was constructed in 1794 and still stands as a warning to approaching vessels not to come to close to the shoreline for fear of being grounded on sandbanks, the best view of the lighthouse being the one that you get when you stand on the old Victorian pier. Whilst on the pier you could also take advantage of the ice skating rink and café too. The medieval Oystermouth Castle is a reminder of the region’s more ancient past and now houses outdoor theatre performances during the summer.